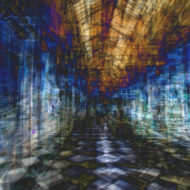 Chris Barnaby does abstract digital art with a definite spiritual aspect. deep thinker, which is reflected in his work. set about a process of self exploration and self learning. technological medium in the rendering of experience/s of ‘the other’. the experiences I have gained confirming this understanding as I live. creative process in many ways. the album cover features a similar ‘early’ version of this same work. This is the completed work. does so quite successfully when seen printed full size. appears in many forms and colours although always like a cross. some of them for exhibit.